Crew member is reading SMS on PDA mobile phone. Do you wonder if a marine cell phone booster is needed in your boat, craft, or vessel? It all depends upon the type of vessel you have. Does your vessel have an enclosed cabin? Or is it an open air boat? Your answer to this question will determine whether a marine cell phone booster will even work in your craft. If you own the type of luxury vessel or working craft that can benefit from a signal booster, we can help you find the one that will work best for you. After all, Solid Signal has been helping improve cellular phone reception and data speeds in boats and ships all across the country. We want to help you with your cellular booster needs, too. 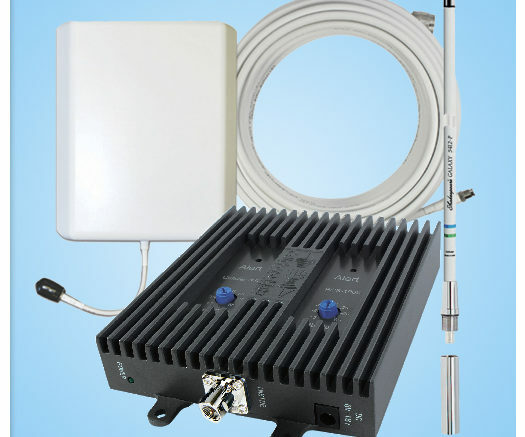 A marine cell phone booster is a system that keeps you connected and provides good data speeds in situations where the slightest of signals is available. These systems use two antennas – one outside the boat, the other inside – and a signal amplifier. If you’re away from when you receive a call, the outside antenna takes the weak cellular signals, passes them through a cable to the amplifier, then sends that amplified signal to the antenna inside the boat. The inside antenna broadcasts boosted signal to phones and other devices in the boat. When you place a call from inside the boat, this process described above operates in reverse. The signal passes through the inside antenna, which sends it through the amplifier then broadcasts the signal to nearby cellular towers. A marine cell phone signal booster is typically used to improve cellular connections on boats, oil rigs, and marinas. If your boat has an enclosed cabin, then you can use a marine signal booster. Why? Well, it has to do with those two antennas we told you about. The inside antenna is designed to work within an enclosed cabin space. This allows for the much-needed separation between the inside and outside antenna, which prevents an effect called “oscillation” from occurring. When oscillation occurs, most cell phone signal boosters begin to power down to help correct the problem. To solve the issue of oscillation, boat owners typically put 15 feet of space between the inside and outside antennas. Open-air boats, such as a speedboat with an open cabin, cannot benefit from a signal booster. These boats have nothing to prevent the outside and inside antenna signals from interfering with each other, which results in oscillation. The oscillation that results from this will render your signal booster useless when you’re out to sea. And let’s face it, that’s where you need reliable signal most, both for entertainment and emergency purposes. So, to put it bluntly, you can’t use a signal booster on any boat that doesn’t have some type of enclosed cabin and at least 15 feet of space between the inside and outside antennas. If you need to improve the cellular connection on your vessel, marina, or oil rig, Solid Signal is here to help. If your boat can benefit from a signal booster, we can match you with the right cell phone booster system or replacement parts. We carry three cell phone booster products that are best suited for marine installations, including one made by Shakespeare. If you want to improve your cell phone reception and data speeds when you’re out to sea, call us at 877.312.4547. Our product experts are happy to recommend the best marine cell phone booster for your needs.